Female artists dominated the 2013 Brit Awards with Emeli Sandé and Adele taking home two of the biggest prizes. Emeli Sandé won best British female and the highly coveted British album title for her 2012 debut "Our Version of Events," while Adele collected the best single trophy for her Oscar-nominated James Bond theme song "Skyfall." Collecting the British Single award via a pre-recorded video, Adele said that she was unable to attend the event as she was "in LA rehearsing for the Oscars." Making reference to last year's Brit awards ceremony, in which Adele was famously cut off midway through her acceptance speech for best British album, leading her to flick the bird to event organizers, the multiple Grammy-winning, London-born singer joked: "I won't keep you too long because I don't want to interrupt the best album speech at the end of the night. But I love you all." Collecting her award for British album, Sandé -- who was nominated in four categories -- said "I think I'm a very unlikely pop star. This was an album I wrote because I didn't have the confidence to sing these things in person, and for me, to have so many people to connect with this album and find strength in these words makes me feel incredible and doesn't make me feel as lonely. I thank everybody who has bought this record. And thank you to everybody who let me make the album I wanted to make, you know who you are you are." First released in February 2012, "Our Version of Events" was the best-selling artist album of 2012 in the United Kingdom, moving over 1.4 million units in the U.K., according to the Official Charts Company. 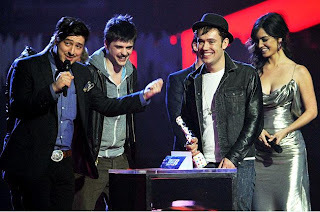 The other big winners at this year's Brit Awards – which is the United Kingdom's largest annual music awards show and traditionally results in a major sales spike for winning and performing artists - were Mumford and Sons, who took home the award for best British Group and performed a rousing version of their Hot 100 smash "I Will Wait," taken from their Billboard 200-topping sophomore set "Babel." The accolade came on the heels of "Babel" winning the album of the year trophy at this year's Grammy Awards. Collecting the highly-coveted award, Marcus Mumford told the crowd: "Thanks very much. We weren't really expecting that. I don't think we've really ever had the opportunity to thank everyone who has come to our gigs because they have got to us where we are and we're really very thankful for that. We were in a [category] with Muse and One Direction, so [this] is a surprise." He continued: "We love being British and we love going around the world and telling people we're British, so we're very proud and very grateful." The two-hour ceremony additionally saw performances from Muse, who opened the show with a stirring, pyrotechnic-laden version of "Supremacy," backed by a 40-plus-strong orchestra. Robbie Williams, One Direction and Ben Howard – who collected awards for best British male and breakthrough – also played live at the event, which took place in London's O2 Arena and was broadcast live on U.K. national network ITV1. The host for evening was British TV personality James Corden, who made the first of several references to One Direction's Harry Styles and his penchant for older women, when he joked with the singer: Let me tell you Harry, Sharon Osborne is here. Annie Lennox is here. Who have you got your eye on?" Meanwhile, other live performances on evening included Justin Timberlake, who delivered a slick, well-received run through of "Mirrors," backed by a 15-strong band; and Taylor Swift, who played a towering version of "I Knew You Were Trouble," in which she stripped mid-performance from a white wedding dress to a revealing black lace costume. Surprisingly, Swift was beaten to the title of international female by Lana Del Rey, whose debut album "Born to Die" topped the U.K. charts in February. Accepting her award, Rey said that she was "honored" and paid tribute to her "managers and [record label] Polydor for helping turn my life into a work of art." In the opposite category, Frank Ocean won the award for international male. "This is definitely a long way from working fast food in New Orleans, so thank you guys for this," said the artist accepting the Damien Hirst-designed statuette. The Black Keys, meanwhile, won best international group, although the band were not in London to accept their award. The newly-created global success award went to One Direction for its record-breaking achievements internationally. The night closed with Emeli Sandé delivering a rousing rendition of "Next To Me." British Album of the Year: Emeli Sandé "Our Version of Events"